(Nashville, Tenn.) Oct. 16, 2012 - Michael W. Smith, a multi-platinum, GRAMMY®, American Music Award and GMA Dove Winning artist partnered with Kroger, MobileSmartBid and several key sponsors to host Rocketown's annual fundraising dinner, auction and evening of entertainment to raise awareness and support for the non-profit outreach for teens. This year's event was themed "Comedy for a Cause" and featured comedian guests, Henry Cho and Jeff Allen. The gathering took place at Rocketown's downtown Nashville venue, commencing with a VIP reception attended by more than 430 guests and followed by dinner provided by Black-eyed Pea. 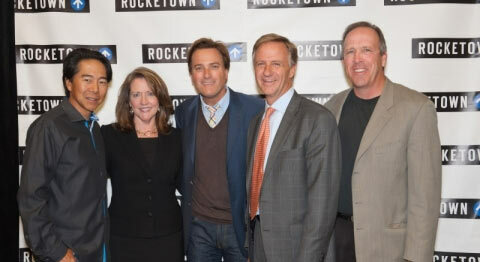 The evening was hosted by Michael W. Smith and Melanie Tomczak, Outreach Program Manager for Rocketown. Musical guests L'Angelus took stage prior to the evening's headliners, comedians, Henry Cho and Jeff Allen. Notable attendees included Governor Bill Haslam and First Lady Chrissy Haslam, author Karen Kingsbury, American Idol contestant Scott MacIntyre, Tennessee Titans quarterback Matt Hasselbeck, several Tennessee Titan players, the entire coaching staff of the Nashville Predators - including Coach Barry Trotz, and many others. The event not only set out to entertain, but to honor key members of the Rocketown board of directors including Tom Harrington and Chaz Corzine for their dedicated work in supporting Rocketown. The evening's "Volunteer of the Year," Ernie Clevenger, was awarded for his services and many examples of how Rocketown has made a difference in the lives of teenagers were captured and summed up through two special teens sharing their stories of how the facility made an impact, changed their lives for the better and how it has influenced them throughout the span of their entire teenage years. "This was a great night -- and certainly a great cause. So many kids have been helped by the ministry at Rocketown," shares founder, Michael W. Smith. "The money from this event will help us do more and serve more kids." Combined sponsorships, generous donations, live auction and new MobileSmartBid online auction generated much needed proceeds that impact day-to-day efforts of Rocketown's staff. Auction items included two trips to perform with Michael W. Smith in New York City at Carnegie Hall, an all-exclusive Yacht trip, a Charlie Daniels autographed fiddle, Tennessee Titans and Nashville Predators sports packages and more. "The evening would not have been possible without the in-kind donations from partners including Belmont University, First Baptist Church Nashville, J. Alexander's, Gary Musick Productions, Arrington Vineyards, Red Bull, Brakefield Lighting, and Music City Tents. We're grateful for their contributions," shares Lisa Bergen-Wilson Director of Development & Communications. Rocketown's mission is to offer hope to the next generation through Christ's love. In the coming year, it will continue to provide that outlet for the community through weekly gatherings, special events and its concerts. Founded in 1994 by Michael W. Smith, Rocketown is a nonprofit outreach for teens, providing opportunities in arts, music, action sports and mentoring programs. Rocketown has been able to help thousands of teens through free counseling, scholarship programs and material assistance. Some of Nashville's most unique classes for youth and teens are offered at Rocketown, including courses in film, art, dance, rhyme, song writing, journalism and graphic design. Rocketown's nonprofit entertainment facility in downtown Nashville opened in 2003 and provides a venue for all ages concerts. Rocketown's facility is complete with an indoor skatepark (Sixth Ave) and snackbar where youth come to hang out and be themselves. For more information, visit www.rocketown.com. Throughout his 29-year career as a recording artist, Michael W. Smith has amassed an impressive catalog of achievements. His 24 albums have garnered multiple honors including an American Music Award, three GRAMMY ® Awards (from 13 nominations), 44 GMA Dove Awards and 33 No. 1 radio hits. In addition, he holds 16 Gold, 7 Platinum and 2 Double-Platinum albums for career sales of 15 million. Most recently, Smith released GLORY, his second full-length instrumental album, on Nov. 21, 2011 and Decades of Worship, a collection of his most popular worship songs, Jan. 17, 2012. Inducted into the Gospel Music Hall of Fame in 2009, Smith has scored film projects, written 12 books and been featured by media outlets including "Hannity," NBC's "Today," ABC's "Good Morning America," "NBC Nightly News," "Larry King Live," "FOX & Friends," The Associated Press, Billboard, USA Today, The New York Times, The Washington Post, Los Angeles Times, Newsweek and more. Constantly giving back to the community, one of Smith's current projects is Rocketown - a nightclub for teens in his hometown of Nashville, Tenn. - which serves as a safe place for young people to enjoy music and for artists to be discovered. He and wife of 30 years, Debbie, are the proud parents of five children. Henry's TV and film credits include appearances on NBC's "The Tonight Show," CBS's "The Late, Late, Show" and NBC's "Young Comedians Special." He served two years as host of NBC's "Friday Night Videos" and had many guest roles on various network sitcoms. Henry's one hour Comedy Central Special, "What's That Clickin Noise?" is currently running, and he can also be heard on SiriusXM and Blue Collar Radio. Some of Henry's film credits include Universal's "McHale's Navy" with Tom Arnold and David Allen Greer; "Say It Isn't So" with Heather Graham and Sally Field; and "Material Girls" with Hilary Duff and Angelica Houston produced by Madonna. Henry was the keynote entertainer for The 59th Annual Radio & Television Correspondents' Dinner attended by the Bush Administration and has worked extensively with Vince Gill, Amy Grant, Willie Nelson, Carrie Underwood and many others. Henry's clean comedy is so versatile that he can headline Vegas and then tour with Michael W. Smith in the same month. This spring, Henry sold a special/pilot to GAC (Great American Country) in which he'll serve as host, co-writer, and co-producer. "The Henry Cho Show" aired in fall 2011 and Henry awaits the chance to do more shows for GAC in 2012. Jeff Allen is the best at what he does-making people laugh as hard as humanly possible. His Happy Wife, Happy Life® message of a marriage gone wrong and redeemed has given laughter and encouragement to millions of people. Jeff's comedy drives home the humor in everyday family life and the joy derived from a healthy marriage. At home with secular, religious and combined audiences, Jeff has performed on every U.S. cable comedy show, in Las Vegas, for corporate engagements and in churches all over the country. He has starred in his own sitcom pilot, Happy Wife, Happy Life®, for PAX TV with Castle Rock Television, the critically acclaimed film and DVD Apostles of Comedy, and the hilarious comedy DVD Thou Shalt Laugh. Jeff has headlined his own national comedy tour, Jeff Allen and Friends: Funny People of Faith and received the Grady Nutt Humor Award-the most prestigious comedy award in the Christian market. A columnist for Living with Teenagers, Homecoming and Homelife magazines, Jeff is also a featured comedian on Bill Gaither's Homecoming, Praise Gathering, Gaitherfest. He has performed at numerous functions with newsmakers such as: John Ashcroft, Ann Coulter, Sean Hannity, J.C. Watts, and Zach Wamp. He is regularly heard on XM Radio; Jones Radio Network; Focus on the Family. Kroger is one of the nation's largest retail grocery chains. The company operates close to 60 stores in Middle Tennessee. Recognized by Forbes as the most generous company in America, Kroger supports hunger relief, breast cancer awareness, the military and their families, and more than 30,000 schools and grassroots organizations in the communities it serves. For more information please visit Kroger.com. MobileSmartBid™ is an innovative bidding technology and vibrant auction service company that empowers non-profits to get the most out of their auctions. Event and auction guests are able to bid remotely through their own mobile device from anywhere in the venue, or even the world. For the first time, through mobile smart bidding technology, participants are notified if they have been outbid and can immediately raise their bid from their phone. For more information about MobileSmartBid, visit www.MobileSmartBid.com or email info@mobilesmartbid.com.